Editor’s note: This conversation is the first installment in a new series of interviews with top co-op executives called “In Their Own Words.” Have a recommendation? Email us at info@ncba.coop. Dan Berger is president and CEO of the National Association of Federally-Insured Credit Unions. Dan Berger joined his first credit union at age nine. It was a savings account that his parents had to co-sign. That credit union—Campus USA Credit Union in Gainesville, Florida—went on to finance not only his first car, but also, recently, a new truck. Four decades later, and he’s still a member. Dan is also president and CEO of the National Association of Federally-Insured Credit Unions (NAFCU), where his deeply rooted belief in the credit union advantage—and ability to communicate that difference before fellow credit union CEOs, regulators and policymakers—have helped transform the 52-year-old trade association into a premiere advocate for the credit union industry. In an interview with NCBA CLUSA last month, Dan said he believes credit unions are most successful when they learn to “look around the corner”—anticipating industry shifts, innovating and adopting new technologies. 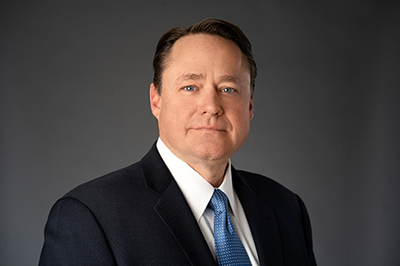 It’s a mindset he first cultivated during a 30-year career in government relations and political affairs, and it’s one he’s firmly planted at NAFCU. Under Dan’s leadership—he joined the association in 2006 and has been at the helm since 2013—NAFCU retooled the association’s focus on three things: advocacy, education and compliance assistance. During our conversation, he explained why doing less has led to sustainable growth—both for the association and its members. He also shared why running your credit union like a fintech company is the future of the industry and why identifying as cooperative businesses is critical to preserving the credit union tax exemption. Excerpts from the interview, edited and condensed for clarity, follow. NCBA CLUSA: It’s no secret that the financial sector is facing consolidation. But despite the mergers, credit unions are still finding traction and new customers. Why? Dan Berger: We saw the first real spike in credit union membership in the wake of the financial crisis. There was such a flight to safety with all the predatory lenders out there, the hidden fees and the big banks taking advantage of American consumers. Credit unions became a safe haven. And as the crisis continued to unfold, we started to see just how pervasive that fraud was. It wasn’t just one institution of bad actors; it was a systemic problem. Even today, it’s Wells Fargo opening millions of accounts without the consent of its customers. You don’t see that within credit unions. And that’s because of their cooperative nature. They’re owned by their members and the board of directors is elected by the membership. I think you get better outcomes when you do everything through the filter of, ‘Is this policy, is this product or service good for the member?’ It’s not, ‘How much fee income can I make off this account, or this customer?’ The credit union mission of people helping people matters, and I think history has demonstrated that during every recession. Banks are subject to the Community Reinvestment Act because of redlining and taking money out of communities and not giving back. You don’t see that behavior at credit unions. NCBA CLUSA: It sounds like the financial crisis really amplified what credit unions were doing all along. Berger: Exactly. Our competition has always been banks, and now fintechs. Apple and Goldman Sachs are even coming out with a credit card. But the one thing banks and fintechs don’t have, and I don’t think will ever have, is trust. In every survey you see out there—and there are dozens done every year that compare financial institutions and folks in the banking space—credit unions are always on top when it comes to trust. Wells Fargo can’t run full-page ads and recreate that trust element they used to have. It’s gone. Credit unions have built and maintained that trust. That trust really is the cooperative advantage, and there are huge opportunities that come along with that. The cooperative structure—which credit unions share—is simply a better business model. You start with that core of trust, and then you build out from there, whether it’s a quality product, terrific customer or member service, or robust technology. NCBA CLUSA: You bring up a key point here—that credit unions are cooperatives, which isn’t always apparent. Even credit union members don’t always know they’re part of a cooperative. Is there a push to change that perception within the credit union community? Berger: We talk about it all the time. Our advantage in the industry really comes down to that cooperative, not-for-profit structure. It’s people helping people, it’s member ownership, it’s one-member-one-vote. It makes a difference. 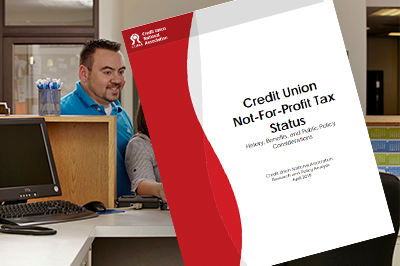 NCBA CLUSA: And, of course, that not-for-profit structure is also part of why credit unions are tax-exempt. How big of a focus is preserving that exemption for NAFCU’s advocacy team? Berger: We’re vigilant. We’ve done an economic study that shows that the credit union tax exemption gives back $16 billion to American communities every year in the form of lower interest rates, higher returns and fewer fees, that holds a lot of other financial institutions in check. Now, you have to show that value to the regulators, to the American people, and to the policymakers on Capitol Hill. We feel pretty good where we are, but you’re beginning to see a big debate on the deficit. It ran up pretty high under President Obama; it’s run up even faster under President Trump. Credit unions are always looked at. We kind of got caught up in that wave of scrutiny toward banks after the recession and we’d like not to be. In the big scheme of things, our tax exemption is a rounding error. The Pentagon spends the equivalent on hammers and toilet seats. You get rid of our tax exemption and the impact would be detrimental to the American consumer and to our economy, but it wouldn’t even put a dent in the deficit. So we need to continue to go after the bad actors in our society who need to be reeled in. But it’s not credit unions. NCBA CLUSA: NAFCU is focusing on growth this year. Can you talk about your time at the association and where you see it headed? Berger: Five years ago, I was appointed CEO and we revamped things. Actually, we stopped doing things, if that makes sense. Trade associations in DC have a tendency to be all things to all people. We had to take a step back and ask, ‘What’s our mission?’ It’s to strengthen credit unions and help them grow. So we asked our members what they needed to grow. And almost every CEO, every member out there, said they needed us for our advocacy, our education and training, and our compliance assistance. So that’s all we do: advocacy, education and training and compliance assistance. If it doesn’t fall into one of those three buckets, we don’t do it anymore. If it’s not driving growth for our members, it’s not driving growth for NAFCU. Now we’re growing a million dollars a year in revenue. We’ve added almost 400 new members in the past couple years. So to be growing like that in a consolidating industry, I think our focus is right. We’re not right all the time, but I think we’ve done a pretty darn good job of seeing around the corners of the industry. NCBA CLUSA: Having that foresight is invaluable, but what does it take to really execute once you’ve identified a path forward? Berger: You have to start recruiting more diverse boards and advisory committees that see some of that stuff that’s coming. You want people with experience and perspective; you want women; you want people of color; you want young people; you want people from different backgrounds who have a different take on things or more experience in a certain area that you may be lacking. I’m blessed with an incredible team and a courageous board at NAFCU, but that transition took time, and it was hard work. ‘We’ve done it this way for 52 years,’ is an excuse I hear at a lot of organizations when people are confronted with change. Well, it may have been right in 1974, but it’s not right in 2019. The financial services sector has economic cycles to deal with, competition, new technologies, cyber security concerns—all these pressures. NCBA CLUSA: So listening to a broad range of voices and being willing to adapt is one thing. What other advice would you give credit unions that are looking to achieve a culture shift that positions them for sustainable growth? Berger: If I was brought in as a credit union CEO now, I would change the culture by acting like a technology firm—not actually becoming the next Amazon or PayPal or Square—but having that mindset. Credit unions can be digitally-minded companies without compromising their mission. 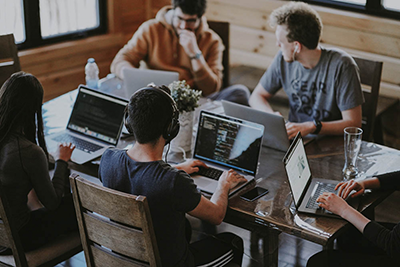 You still have the cooperative structure, you still have one-member-one-vote, and everything is done through the filter of, ‘Is this good for the member?’ But you need a technology culture throughout your credit union. I mean, your smart phone is your mobile branch at this point. So my advice would be to take a look around the corner. You’re going to have to adapt anyway. Do it before you have to. NCBA CLUSA: Can you give us an example of a credit union that did a good job turning their company around? Berger: I would give you Keys Federal down in Key West, Florida. Under the leadership of CEO Maggie Sayer, the credit union was completely turned around. They’re growing and doing a wonderful job. Here locally, Karen Rosales and the Arlington Community Federal Credit Union are just doing an incredible job. And this is a big market, as you can imagine. So for a small credit union to really grow in a market like this is significant. Karen and her team work harder than almost anybody I’ve ever seen. If you have a plan and you have a great team with a great work ethic and you execute, you can get it done. But it’s hard work. It never happens by accident. NCBA CLUSA: Let’s talk a little more about the landscape credit unions are navigating right now. We talked about competition earlier, but that’s not the only challenge the financial services industry is facing. How can credit unions continue to grow in this environment? Berger: Consolidation is one of our biggest challenges. There are a few new credit unions being started, but not at a quick enough pace to replace the ones that are going offline or merging. In some cases, it’s the regulatory burden. Bank of America has 250 compliance attorneys. A credit union may have one, or two credit unions may share a compliance officer. That regulatory burden is enormous. Other times it’s the cost of adapting to technology. It’s not just millennials—my 84-year-old mother banks online. Everyone expects to access their money quickly and easily and to do that effectively you have to have a robust technology platform. Those technology costs, those cyber security costs—they really hit bottom lines, especially for small- to medium-sized credit unions. For NAFCU, growth is continuing to provide value. If we’re focused on being passionate and delivering terrific member value, then we’re helping credit unions grow, which in turn is strengthening communities. There are huge opportunities out there, but it takes strong leadership to innovate and push the industry forward. And it takes a strong board to allow senior management to make those kinds of decisions and take those risks. NCBA CLUSA: And that really speaks to the trust element we talked about earlier. Berger: It does—it all comes back to that core of trust. It’s my staff trusting me to provide the training and career opportunities and benefits necessary for quality of life. It’s my board trusting me and us trusting our board. It’s the American consumer trusting credit unions. Not every risk pays off, but I think people are more forgiving if they know you have their wellbeing in mind and they trust you. That’s how cooperatives got started, really. They did not trust the existing organizations to have their best interests in mind, so they said, ‘Hey, let’s do it ourselves. I trust you; you trust me; let’s create a cooperative and work together. We’ll get better deals and we can pass those savings on to our customers.’ That seed of trust is the most compelling, sustainable thing that cooperatives and credit unions have.